I’m a planner and an organizer. I’m early for everything and I always like to be prepared. So when I began working with children with Autism Spectrum Disorder and other special needs it was a HUGE shift for me to learn that coming in with a pre-planned “agenda” and session plan might not be the best way to meet my client’s needs. Of course I keep the same basic “structure” each week – Hello Song, Socialization Song, Movement Activity, Instrument Activity, etc, – I think this helps alleviate some anxiety in my clients because they know what to expect when they come into the session. However the true beauty of music therapy – as I see it – is the possibility of flexibility within that neat little structure. I can sing my same Hello Song with a drum accompaniment, with a guitar accompaniment or with a maraca accompaniment. I can work on turn-taking and sharing with a cowbell, tone bells, or a clatterpillar. I can ask the children to move like an elephant, or jump on a trampoline like a kangaroo, or slither on the floor like a snake. I can work on selective attention with the glockenspiel, the cymbals, or hand bells. The possibilities for variety are endless. I try my best to be in the moment, closely watching my client’s needs, and making adjustments when necessary. This happened in a session last week! Had I been so stuck to my session plan and insisted on them sitting, the intervention wouldn’t have been nearly as effective. So slowly, slowly I am breaking free from my session plan obsession. Can you relate? Leave a comment below and let us know – do you always stick to a session plan or do you go with the flow? We’d love to know! Yes! I can absolutely relate to this post. My 1:1 sessions with children with autism are easy to adapt. Sometimes I just have to restructure the order of my interventions. Other times we go with something they’re doing that results in a much more effective song or activity for them that I end up taking into my work with other kids. The hardest thing for me is modifying a new intervention for a group – sometimes I’m able to shift the approach just slightly and it ends up working well. But there are definitely times when I have to accept that my new idea is bombing and needs some work. So we cut it short and go to a favorite instead. Flexibility & humility are such an essential part of my music therapy groups! Flexibility and humility – so true!! I’m so glad you can relate Sarah! Glad you made it through the power outage successfully! I can relate too. I’m a student in practicum in early intervention classroom sessions, and although my sessions follow a similar outline each time, I seem to always alter some small part of at least one of the interventions from the plan. I am just starting to get the hang of this (this is also my first semester as a solo clinician). In one session a few weeks ago, I used a song about sharing and had the clients pass a glockenspiel to a peer after improvising a solo for 8 measures. One of them to decided to hand one of the mallets to a peer and then play a duet with the peer, which I hadn’t thought of when I planned the intervention, but it was an interesting outcome. All the time! It was hard for me to break out of a strict session plan, but now I go about it in a similar manner with my 1:1 clients. I have a bag with just a little bit of everything in it, so I can make a change on the fly if needed. For example, if we’re working on color identification, maybe the client doesn’t want to play the color shakers, but loves the rainbow scarves. I will invite the client to play/move with the scarves and I’ll slip in the color identification goal as we’re working. I too can relate. I practice music therapy in the Philippines & like you, I plan my sessions but end up doing what was not in the agenda. Among other things, we need to be creative and we need to be quick thinkers. But it’s well worth the challenge of adapting to situations when the children’s needs are better and more pleasantly addressed. Even in senior living communities, flexibility is important. I have to adjust to to the aches and pains of the day, the death of a friend, etc. Being present and aware of their needs in the moment is always more important than the completing the carefully planned session. So, so true JoAnn, thanks for bringing that up. I think clients of all ages and abilities benefit when we’re able to be flexible and in the moment, and meet them where they are. I *just* hit publish for a post on the same topic. Great minds think alike, huh? I think one of the best things a music therapist has to offer is flexibility in the moment. Anyone can follow a lesson/session plan given the right circumstances, but it’s our ability to adapt based on the needs of clients on a given day that really makes all the difference. I don’t think this is population-specific either. I use a similar session plan several times for the various senior living groups I see, but the flow of each session comes out differently every time. I really try to highlight that when I’m talking with folks about how music therapy works in senior living. Thanks for your input Rachelle! I agree completely, being flexible and “in-the-moment” is not population-specific. 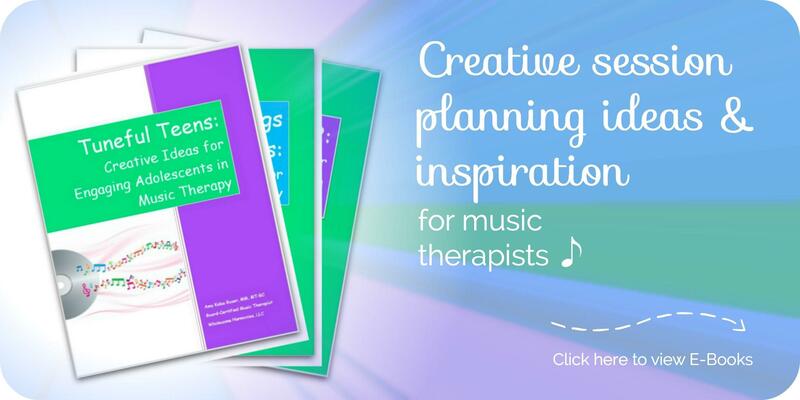 It is a fundamental part of what we do as music therapists. I look forward to reading your post on this topic! !